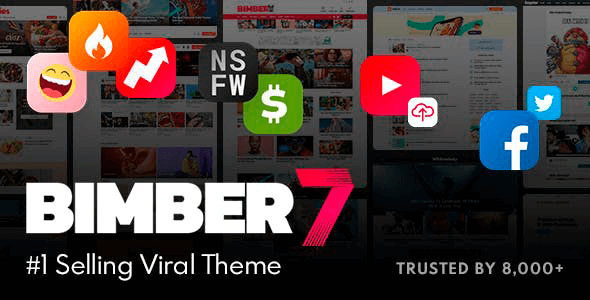 Bimber is a viral magazine WordPress theme from Themeforest magazine that lets you launch a fully functional viral site in no more than 24 hours. It comes with powerful sharing buttons; popular, hot, trending listings and multiple ad locations. Everything in a lightweight and easy-to-use package. Just start today and go viral today! Microdata (schema.org), rich snippets support. Full RTL support (right-to-left languages like Arabic or Hebrew). Support for multi page articles. Compatible with caching plugins (WP Super Cache and W3 Total Cache). Integration with free, highly popular MailChimp for WordPress plugin. Place subscribe form after post content, inside grid collection, inside list collection and inside sidebars. Create listicles with images, gifs, self-hosted videos and embeds. Popular, hot and trending lists. Fancy badges for popular, hot, and trending posts. Paginated posts with big, bold navigation. Share count visibility threshold – no more “0 shares” messages. View count visibility threshold – no more “1 view” messages. Comment count visibility threshold – no more “0 comments” messages. NSFW posts (Not Safe For Work). Maximize Time on Page with “You may also like”, “More from category” and “Don’t miss” sections. Powerful Social Sharing Buttons: fake share counts for viral newbies; image sharing; big buttons with clear call to action; share count visibility threshold – no more “0 shares” messages and other functions. Hi, please update Bimber – Latest version is 3.3 – 14 November 2016, Major update. Please, I need it urgently. Why is it telling me i need to purchase again in order to download. you have had my money for this already. Hi, how could I import the demo in this new version? The theme requires registration. VERSION 6.0.1 – 27 July 2018, minor update ?? paypal payment no more automatic? Why? We accept automatic payments only. All in one Viral magazine Theme ! Great ! You can just start, upload or create posts and add ads :). I’m sorry .. It’s working now. I removed all previously installed theme and plugin then install nulled version again. One of the best WordPress theme for viral news magazine type website. Using it at the moment and it’s packed with load of features. Great theme! when will you update to 7.0.2?